How do you make focaccia? Look no further than....well....about a million recipes. 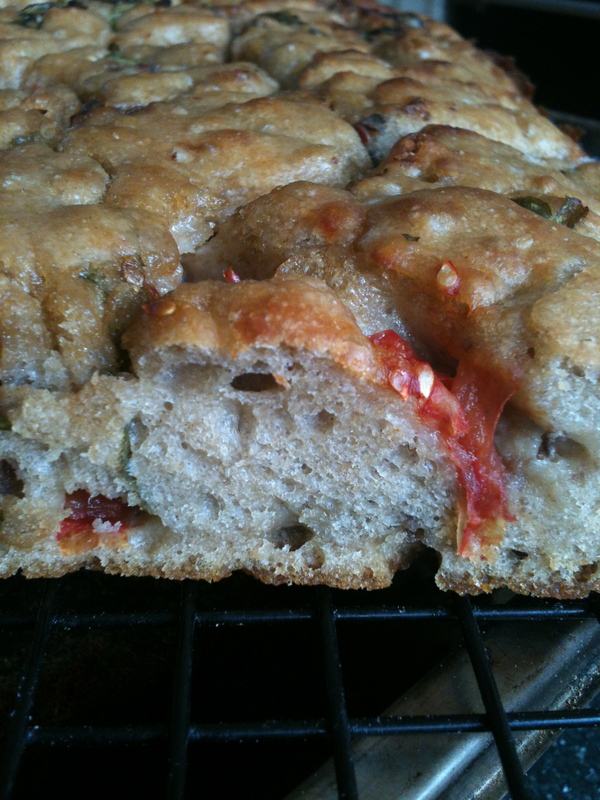 There is no one way to make focaccia. From village to village it's all different. 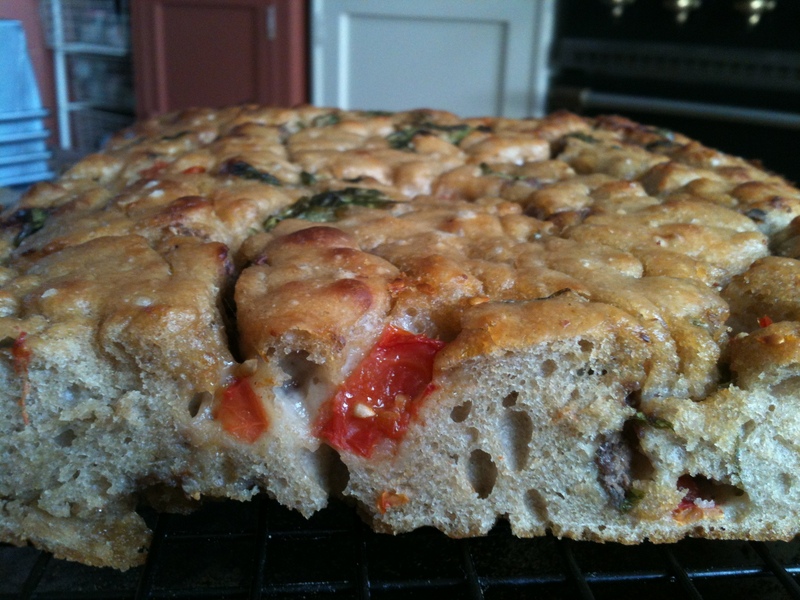 So you just need to choose: How do you like your focaccia? Thin and crispy and oily? Fat and doughy and not oily? With herbs and sun dried tomatoes? With avocado and epazote? With sage, rosemary and salt? The answer is this: it's up to you. If you like your focaccia thin and crispy (the way we do here at the global HQ of Virtuous Bread) this amount of dough is perfect for a pan about 22 x 30 cm (inside the pan). If you want it fatter, put the dough in a smaller tin. If you want it thinner, put it in a larger tin. It's really that simple. Put whatever you want on the dough to make the focaccia that reflects who you are in that moment. Today, the moment was a can of anchovies in olive oil, three tomatoes from the garden, and some parsley because that's all I had. No sage, no rosemary - not even an onion. 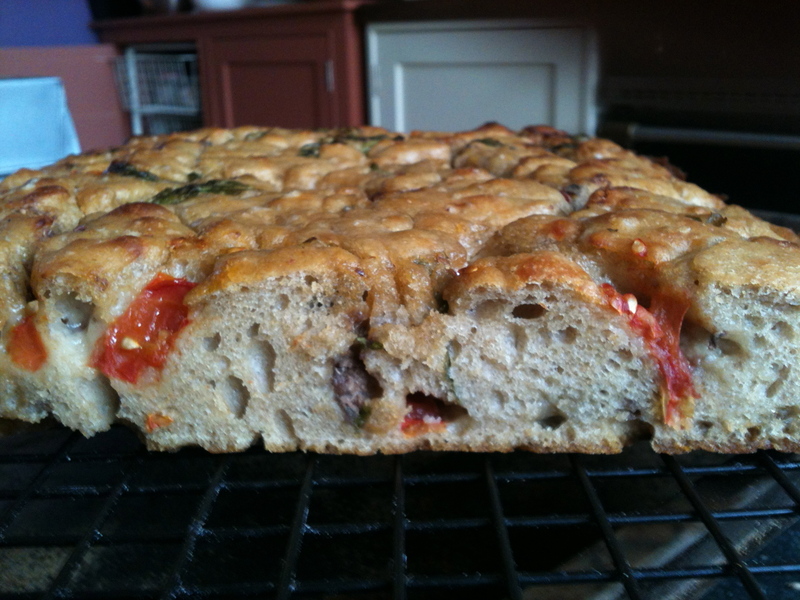 The cupboard was bare and the focaccia was delicious. Just ask the Bread Angels, they will tell you! 1. The dough is VERY wet, more like a batter than a dough. This is correct. 2. There is no olive oil in the dough. This is correct. 3. There is no salt on top of the focaccia and this is because the anchovies are plenty salty enough. So, put all the ingredients in a big bowl and either just kind of push and pull it around IN THE BOWL (it's too liquid to be kneaded outside the bowl) for 10 minutes by hand or put it in the mixer with the paddle attachment and turn it on for 10 minutes. Don't use the dough hook if you have a paddle because the dough hook leaves half the flour on the bottom and you have to keep stopping and turning the dough over to make sure the flour is hoovered up. This dough is so liquid that you can put the yeast (whatever kind you are using) right in at the beginning. No need to proof. Cover the bowl and let the dough sit for 2-3 hours - until it is hugely risen and there are blisters on the top of it. Take the baking pan and cut a piece of non stick parchment paper to fit flatly on the bottom. If you are confident your pan is non stick, you can omit this. If not, put the paper in the pan and then slosh in a lot of olive oil. Enough to liberally cover the bottom of the pan - corners and all. Pour in the dough - literally pour it in and use a scraper to get all of it out of the bowl. Oil your hands and get under the dough, gently stretching it all the way to the corners if you have to. Leave this dough in the pan for an hour. I don't bother covering it because whatever you use always ends up with dough all over it. Heat the oven to 230 degrees C.
Blob the anchovy in little blobs all over the surface of the dough, trying to blob it evenly. Scatter over the tomatoes and the parsley and then sloosh some more olive oil over the top. Wet your fingers and thumbs under the tap (stops you sticking to the dough) and then push them down into the dough sharply and quickly all over its surface to make dimples in the dough. This seves a dual purpose: to push the topping into the dough and to make pools to collect the oil (yum). Pop it in the oven and bake it for 20 minutes on a high shelf. When you take it out of the oven, invert a cooling tray over the pan and turn the focaccia over and onto the cooling rack. Remove the paper (if you put it there) and then invert a second rack over the focaccia and turn it over so it is face side up on a rack. That way you can admire it until it is cool enough to cut. I always cut focaccia with a straight edged knife rather than a serrated one as the serrated ones can sometimes tear it rather than cut it in neat edges. I warn you - this might set you free. So if you don't want to be free, I advise you not to bake it.